Mystery object coming into focus past Pluto — Pluto may be long past, but NASA’s New Horizons spacecraft is by no means finished with the outer solar system. For the second time, New Horizons has observed 1994 JR1, a 145km-wide Kuiper Belt Object (KBO) that orbits over 3 billion miles from the sun. The latest observations, made on April 7th and 8th by New Horizons’ Long Range Reconnaissance Imager and composited in the gif at this link, smash the spacecraft’s own record for our closest encounter with a KBO. ~ I have identified it – it’s a blob. Mega-tsunamis on Mars — Mars once featured a vast ocean that covered its northern hemisphere. New evidence suggests this Martian sea experienced at least two mega-tsunamis triggered by meteor impacts. Traces of these cataclysmic events can still be seen on the Martian surface, and they could still contain traces of ancient life. ~ It just sounds more and more attractive, doesn’t it? Jupiter’s Europa more Earth-like — Europa, Jupiter’s watery ice-moon, has long attracted attention as a possible site for someday finding life. A new analysis shows its oceans may be even closer to our own. Oxygen production in both Earth and Europan oceans exceeds hydrogen production by almost exactly 10 times. 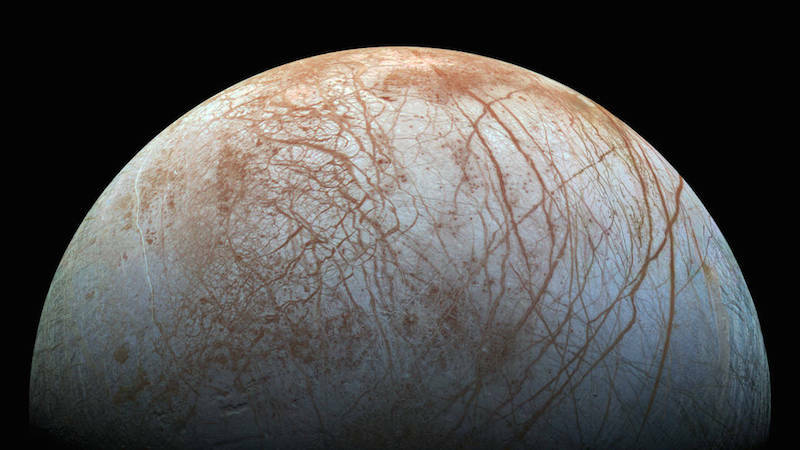 This similarity in the proportions already has researchers pointing out that it could mean oceans on Europa could play a similar role to Earth’s oceans in spawning life. Australian-invented solar panels most efficient — Most commercially available solar panels only are able to convert between 15 and 22% of the sunlight they’re exposed to into electricity. As part of an ongoing effort to improve the efficiency of increasingly important solar technology, a team from UNSW has created a solar cell module that boasts a world record efficiency rate of 34.5%. ~ The sun shines on Australia. DARPA’s scheme to destroy chemical weapons — Agnostic Compact Demilitarization of Chemical Agents (or ACDC) yields no toxic waste products, and all of the tools are portable. One of McQuade’s set ups, a waste-to-energy engine, could run its electrical systems entirely off the power generated during combustion. ~ But it’s a long way to the top. 3D printer works its magic in the air — Lasers and metal were part of 3D printing for decades before the machines became affordable for personal use. But researchers at Harvard are demonstrating a new technique by which 3D metal structures can be printed in midair, without the need for anything supporting them. IBM’s new storage is 50 times faster than Flash, and also cheaper — Flash storage is not as fast as RAM; but RAM can’t be used to store your regular files because of its volatile nature – ie that when the powers off it’s no longer holding data – and also RAM is expensive. It appears we may soon have the perfect middle ground: scientists at IBM have demonstrated reliably storing 3 bits of data per cell using a relatively new memory technology known as phase-change memory (PCM). ~ IBM, still in the game. A few scraps of paper can turn dirt into a super strong building material — As far as building materials go, they don’t come much cheaper than dirt, which is literally everywhere and mostly free. But soil isn’t terribly strong and has a habit of forming a shallow pile rather than more structurally-beneficial shapes. Luckily, making dirt super strong is incredibly easy. Groundbreaking gadget claims to fit in your ear and translate foreign languages in real-time — A tiny gadget lets two people who speak a different language to each other yet understand each other. The gadget, called Pilot, translates English, French, Spanish and Italian. Pilot, which has yet to be launched, is priced at US$129. It works by being connected to two different people, speaking two different languages, and translates what they are saying in your ear.But they have not said how it works except for that it uses ‘translation technology’ embedded in an app. Titan’s methane lakes — A radar scan of methane-filled lakes on Titan, Saturn’s largest moon, was taken by the international Cassini mission as part of a study into what forms depressions on Titan. Although scientists have a handle on why the lakes are filled with hydrocarbons — turns out it rains liquid methane, thanks to the -180°C climate — the origins of the depressions are less obvious. NASA is heading for Europa — Jupiter’s moon Europa is covered in a thick layer of constantly-shifting ice which appears to be floating atop a deep, warm ocean. Scientists have long suggested that it’s the most likely place that life might have evolved beyond Earth. NASA has just confirmed its first mission to Europa has entered the development phase. ~ I await the report. The world’s first 3D-printed platinum spacecraft thruster — More than 600 ignitions and an hour of firing was the heavy test for the world’s first spacecraft thruster with a platinum combustion chamber and nozzle made by 3D printing. And it successfully passed its baptism of fire. ~ I wonder if they started with a mug. Your kids will need upgrades to go to space — In the six decades we’ve been sending humans into space, scientists have learned just how truly bad it is for us to live off-planet. So we need a redesign. ~ I have a much better idea: sort out Earth. This map of 2100 should make you nervous about the future of farming — When we imagine the farms of the next century, the images tend to be cleaner, more clinical, perhaps more akin even to a laboratory than a field. But the future that’s actually on our horizon looks much darker and messier than all that. ~ These things can also be seen from ground level – if you go there. Russia develops anti-armed-drone tech — A state-owned Russian engineering company has developed, and is now testing, a new kind of super-high-frequency gun that is said to be capable of deactivating unmanned aerial vehicles from 10km away. ~ There goes that particular US advantage. Heart-on-a-chip uses gravity to mimic a human pulse — A small, clear block may not look much, but it uses some of the world’s most basic physics to accurately recreate the rhythms of the human heart in the laboratory. A team from the University of Michigan has turned to gravity to help recreate the biological phenomena of the heartbeat. ~ I just watch rom-coms to replicate the affect of a human heart. Slithering modular snakebots the future of robotics — Snakebots could change robotics as we know it – they are modular robots that look and move like snakes. They aim to make robots both reprogrammable and responsive. ~ What about our instinctive snake revulsion? Japanese robot reads your emotions — Starting this weekend in Japan, people can buy a talking, person-shaped robot that reads your body language and gets sad when you turn off the lights. Pepper has its own emotions, a feature that’s been added since the robot was initially announced last year. In Tamagotchi fashion, Pepper gets lonely if you ignore it, and laughs if you tell it a joke. It cann’t do manual labour – it’s more an app-customisable animated computer. ~ US1600 and it’s yours. The telescope’s powerful light sensor is used to find the locations of Earth-sized planets that might dwell in the habitable zone. NASA’s Kepler Mission discovered 1000 planets in its quest to find life — Six years ago this month NASA shot the Kepler telescope into the heavens on a galactic planet-finding mission. 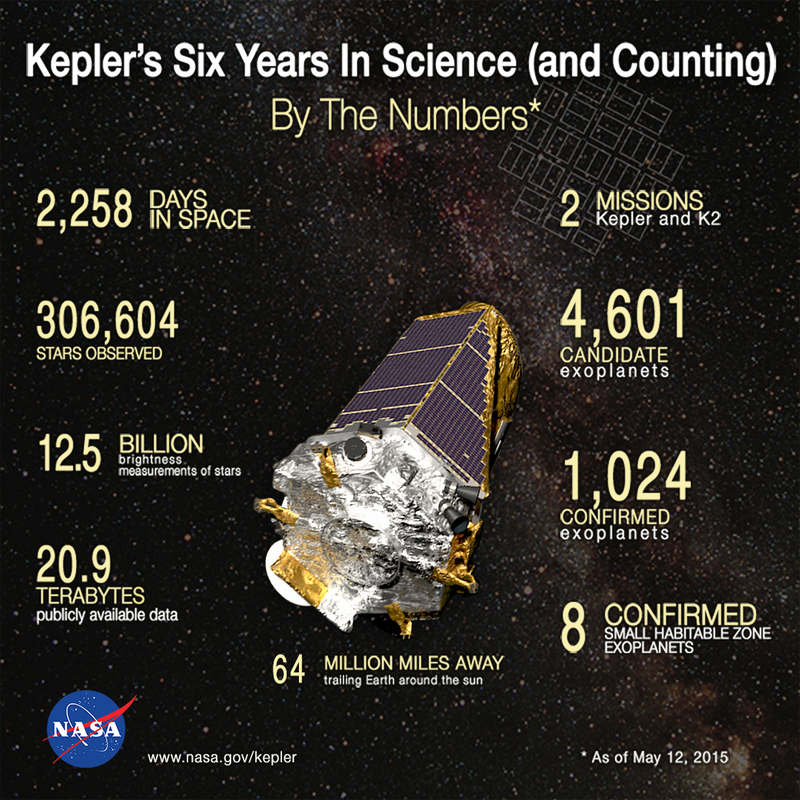 Now, the space agency has released a graphic (above) showing some figures from its quest. New time-lapse shows the Neptune system as never before — Dwarf planets, comets, and asteroids are all the rage these days, but we shouldn’t neglect our Solar System’s outer gas planets and their moons. In this new NASA video, 70 days of Neptunian activity was compressed down to 34 seconds — and the effect is pretty cool. ~ Neptuned in the bud. Europa’s surface like cracked glass — A false-colour image of Europa, Jupiter’s fourth-largest moon, shows the water-covered giant has the smoothest surface in the Solar System. The criss-cross chunks of ice are may be caused by asteroid impacts, which moves the ice around – then it refreezes in the haphazard pattern you can see here. ~ Or it might be caused by … almost anything. Bright spots — NASA’s Dawn mission, since moving on from Vesta, has begun to map Ceres, constructing the highest resolution global map ever, with better data to come. The greatest mystery so far is the two bright white spots at the bottom of a deep crater, brighter and more reflective than anything else on the planet’s surface. ~ Someone left the car lights on. 3D printing pills in odd shapes aids absorption — Medicine is one of the more exciting fields that 3D printing promises to radically innovate. Researchers in the pharmaceutical field have instead been dabbling with custom-shaped pills optimised for every patient’s treatment needs. ~ Pyramid-shaped pills are absorbed by the body the fastest; cylinder-shaped pills take much longer. How Pharaonic! A weird new supercooled material crystallises and glows when touched — Diketopyrrolopyrrole (DPP) derivatives, which has similar but also odder properties than even super-cooled water. One particular derivative called DPP8 can be supercooled to 200F below its freezing point. When lightly touched, DPP8 suddenly crystallises, not unlike water turning into ice. The yellow crystals glow under ultraviolet light. ~ Perhaps it’s all the PP. Napa earthquake unearthed a time capsule — Curious onlookers gathered at the Napa County Courthouse in California to glimpse the contents of a time capsule from 1979. They learned the time-capsulers of the 1970s included a bottle of the region’s favourite adult beverage.